Guideline Group, Eye Doctors Disagree On Vision Tests For Seniors : Shots - Health News The U.S. Preventive Services Task Force says there isn't enough evidence to know whether vision screening given by primary care doctors benefits patients. 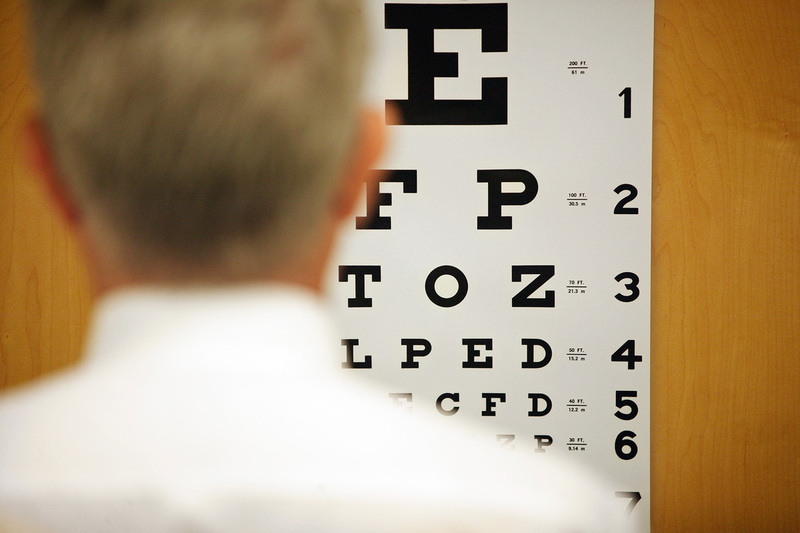 How much value is there for seniors in staring at the eye chart in the primary care doctor's office? Some doctors and a key group of preventive care experts aren't seeing eye to eye on seniors' need for vision screening during primary care visits. There's not enough evidence to know whether giving seniors a vision test when they visit their primary care doctor will lead to earlier detection and treatment of cataracts, age-related macular degeneration or refractive problems that could require corrective glasses or contacts, according to guidelines published March 1 by the U.S. Preventive Services Task Force in JAMA, the Journal of the American Medical Association. The task force, an independent group of medical experts, evaluates the scientific evidence related to preventive services for patients that don't have symptoms or signs of medical problems. Under the health law, services that the task force assigns a grade of A or B based on the strength of the evidence must generally be covered by health plans, including Medicare, without charging consumers anything out of pocket. In this instance — screening for impaired visual acuity in people age 65 and older — the task force assigned an I grade, saying the evidence was insufficient to assess the balance of benefits and harms of screening, the same grade it assigned screening in 2009 when it last reviewed the evidence. An organization of eye doctors and surgeons criticized the task force recommendation. In an editorial published in JAMA Ophthalmology, Dr. David Parke II, chief executive officer of the American Academy of Ophthalmology, argued that the task force didn't give enough weight to supporting evidence about the health and quality of life benefits of identifying and addressing visual problems early. There's a misperception that seniors get an eye exam every year, Parke said in an interview, but many don't. "This is simply an issue of whether it makes sense, when a senior is in a primary care situation, to look at an eye chart and see if they can see well," said Parke. "For a substantial percentage of seniors it may uncover a treatable disease." The task force report said that up to 15 percent of people age 65 and older reported having problems seeing, even with corrective lenses. Many visual problems increase with age, including cataracts, which are a clouding of the lens of the eye, and age-related macular degeneration, in which part of the retina deteriorates. While agreeing that early detection is generally important, Dr. Alfred Sommer said it is unlikely that having seniors read an eye chart at their primary care physician's office would identify many serious eye problems. Sommer, an ophthalmologist and professor of epidemiology at Johns Hopkins Bloomberg School of Public Health who also wrote an editorial in JAMA Internal Medicine about the vision guidelines. It said that an eye test can identify refractive problems, but that it isn't likely necessary. "Most people get glasses when they feel they need them," he said. For other eye conditions, such as macular degeneration, glaucoma and diabetic retinopathy, it's unclear that screening asymptomatic seniors in a primary care screening will be beneficial, Sommer said. That's because "none of those conditions necessarily reduce your vision until they're bad," and probably wouldn't be picked up with a simple vision test, he said. Cataracts, meanwhile, can reduce vision early but aren't more difficult to treat at a later stage, Sommer said. The American Academy of Ophthalmology's own recommendations call for people age 65 and older to have a comprehensive eye exam with an ophthalmologist every year or two. For seniors who are concerned about eye health, that's good advice, Sommer said. Kaiser Health News is an editorially independent news service supported by the nonpartisan Kaiser Family Foundation. Email questions or suggestions for future columns:KHNHelp@KFF.org. Michelle Andrews is on Twitter: @mandrews110.